The Temple has been the nerve centre of religious activities in Jerusalem before, during and after the time of Jesus. It has been the symbol of the presence of God in the lives of the people. The structure of the Temple has a unique structure, with layers of inner perimeters beyond which categories categories of people could not thread. The Court of the Gentiles was the first perimeter of entry into the Temple. Everybody was allowed to enter this perimeter including the Gentiles, women, the blind and the lame. No Gentile could go beyond this point; any Gentile who went beyond this point could face death. Further inside was the court of the women of Israel. It constituted the next inner perimeter of the Temple. The women were allowed into the Temple only up to this point. Beyond this point, they could not be seen. The next perimeter was the court of the men of Israel. The men of Israel who were able to keep themselves from uncleanness were allowed up to this inner perimeter. The next inner perimeter was called the Court of Priests. In this place, one could find the altar that was built for the Lord. Only Priests were allowed up to this point. In other words, if you were not a Priest, you could not be allowed to enter. The final inner perimeter was called the Holy of Holies. This place was regarded as the holiest section of the entire Temple structure. Only the High Priest was allowed access to this place, even that happened only once in a year on the Day of Atonement. There was a curtain separating the Holy of Holies from the next section of the Temple. The Temple during the time of Jesus was built by Herod in the 18th year of his reign, according to a historian called Josephus. This was the very Temple that was being used by the Jews at the time of Jesus. It was destroyed by the Romans in AD 70. However, there were two other Temples that were built before this one though all of them stood on the exact spot, on the land that was bought by King David for that purpose on the Mount of Moriah in Jerusalem. The very first one was built by Solomon after he succeeded his father David. This first Temple was destroyed by the Babylonians in 586 BC after a 400 year period of existence. The second one was built on the same spot after the Jews returned from exile. This construction was led by Zerubabel and therefore the construction is ascribed to him. This Temple lasted for 500 years. There was a very large company in charge of the Temple who were all Priests and Levites. This included the High Priest, as the head, and about seventy thousand others. The total was divided into twenty-four companies and each company was to serve in the Temple for a couple of weeks in the year. The functions of the priests were to lead the worship, to maintain the fire on the altar. 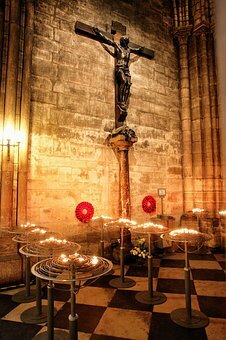 They were also to trim the lights on the candles and to prepare the Bread of Presence.